Elementary School Spelling Bee time: The spelling of the word we are discussing here is “NICKEL” rather than “NICKLE.” “Nickle” is a last name, while “nickel” is the metal that is used with nickel-plated cases. Easily a third of the time we see people asking for “nickle” plated cases and it does make us wonder if the people doing the plating were named “Nickle,” or if the cases were plated with people named “Nickle.” I kid, and we always know what people mean, but the right way to spell it is “nickel-plated cases.” I feel like the only useful method of remembering whether it is the “el” or the “le” is that it is Spanish Nick(“el”) rather than French Nick(“le”). I doubt that will be useful to many of you, but maybe for some you’ll always remember it this way now! 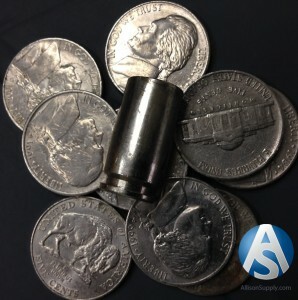 The most-mentioned benefit is that nickel plated brass doesn’t tarnish like yellow brass does; if you’re going to carry loaded ammo somewhere exposed or somewhere against leather (The tanning of leather is a common culprit in the ruining of brass cased ammo), or if you will be loading/unloading your carry ammo into a magazine multiple times, then nickel plated brass casings for your ammo may be a good choice. A nickel plated case almost always looks bright and shiny even if you just picked it off the ground, and that means you really only need to tumble to the point of it being clean, rather than to get a specific polish for appearance. Nickel is slightly “slicker” than yellow brass is, and that can help a finicky semi-auto perform just a little bit better, or can make speed-loading a revolver just a little easier as well. Finally, due to its resistance to corrosion nickel plated cases can be good for ammunition that you plan to put on the shelf for an extended period of time, rather than shooting them next weekend. Not necessarily in order of importance, but the main two are that nickel plated cases anecdotally crack/fail more quickly than yellow brass cases, and that the nickel plating can flake off in the sizing die and can scratch your other cases. Nickel is a harder substance than brass, and if it does flake off inside of your die, it is possible that it will stay there, and those small pieces can then scratch your yellow brass cases. Lubing your cases in advance (even if using carbide or other non-plain-steel dies) can help cut down on the likelihood of flakes in your dies, and cleaning your dies after loading with nickel can also cut down on any problems. Or, you can do what I do and keep a separate sizing die to use on nickel plated cases just as added insurance (A good $20-$60 backup investment anyway). It would seem to make sense that a nickel plated case would fail more quickly than a yellow brass case due to nickel being a harder substance and offering less “give” when subjected to stresses (while brass will typically bend-but-not-break). In the absence of any scientific testing (added to my to-do list), I’d say just expect that your nickel plated cases won’t last as long, and be happy if they do. The most common special use of nickel plated rounds is to segregate training rounds from “duty” or “carry” rounds. While I’m a proponent of “practice like you want to play,” there is something to be said for easy identification outside of viewing the projectile itself. Case separation: If you’re taking 38 special and 357 mag cases to the range on the same day (or 40SW / 10mm, or 9mm / 380, etc), load one in nickel plated and one in yellow brass in order to make sorting easier after picking them back up. 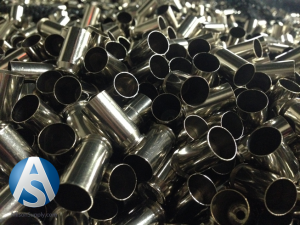 What caliber rounds are likely to have nickel-plated brass cases? We have a collection of options of nickel plated brass cases in our online store here, and the most commom cases that you’ll see loaded into nickel plated casings are the self-defense rounds (Federal, Remington, Winchester and others all have premium self-defense loads that use nickel plated cases). As a final note, I tried to give “casings” vs “cases” equal billing in this article after getting some grief about my reluctance in the last article to call them anything but “cases;” it didn’t feel right, and I’ll probably go back to my curmudgeonly ways after this one is over! Your article is very informative. I prefer Nickel cases to yellow brass. In my case they just seem to stand the test of time vs Yellow Brass. They also seem a little tougher too. You were right on about the cracking though, I’ve noticed cracks but mostly around the case mouth. Thanks again for the info and have a good day. I worked in manufacturing (all sorts of stuff) and I’m somewhat familiar with methods of plating. I’m sure brass cases are electroplated . This is a method in which the cases are cleaned completely, placed in a tumbler barrel and lowered into a solution of acid and water. The tumbler rotates keeping the brass moving all the time. A DC electric current is flowing through the acid and casings. There are baskets of nickel “crowns” suspended in the acid . the current removes nickel molecules from the crowns and carries it to cases which attract it to the surfaces of the cases. This current realigns the brass molecules and this makes the cases harder and more brittle. I hope this helps to better understand the difference in plain brass and nickel plated brass.